Rule number one when selling a car; know what you’ve got. 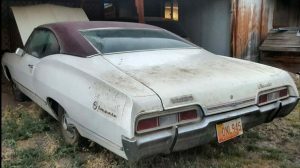 The seller of this Caprice Convertible is advertising it as a 1974 model, but it is actually a 1973. Checking the VIN number confirms this because sometimes cars can be reconstructed with parts from different years. 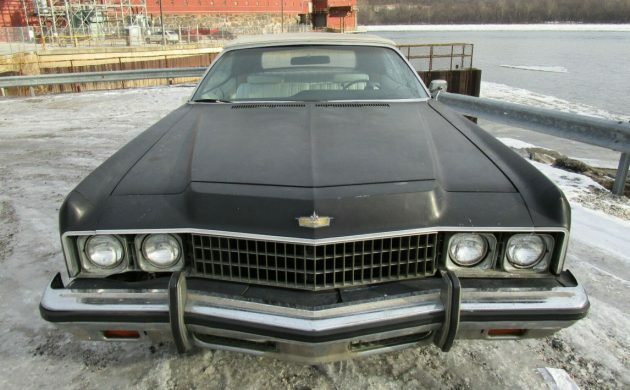 Here is a 1973 Chevrolet Caprice convertible for sale here on eBay in York Haven, Pennsylvania. 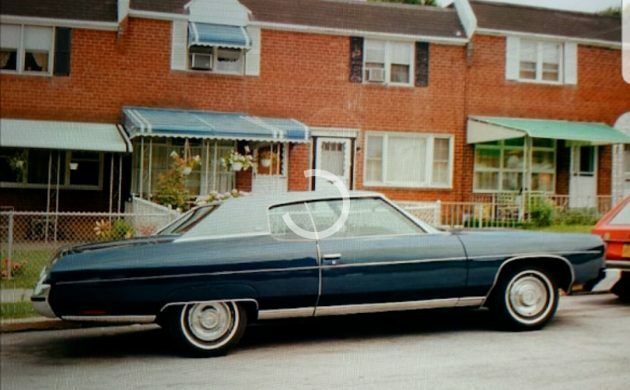 The year 1973 was the first year for the Caprice convertible and was produced through 1975. This Caprice has a cracked area underneath the passenger side headlight. The bumper filler looks warped and possibly cracked. The tires have plenty of tread, but they are about 25 years old and have flat spots from sitting, so they will need replacing. The convertible top will also need replacing and the rear bumper is missing its plastic/rubber strip protection. For the past 15 years, this Caprice has been stored inside and not started. In the past four weeks, it has been taken out of storage. Gas was added along with a new battery, oil, and filter. The car started up and is running well. Overall it is a solid straight car that has never been modified except the paint. It was originally blue but was painted brown in the early 1990s. It has some issues as there are several scratches and surface rust areas. The car has a good frame but there are rust blisters starting on the quarter panels and trunk lid. The floors do have some small minor patches. While the outside says Caprice, the inside says Impala. 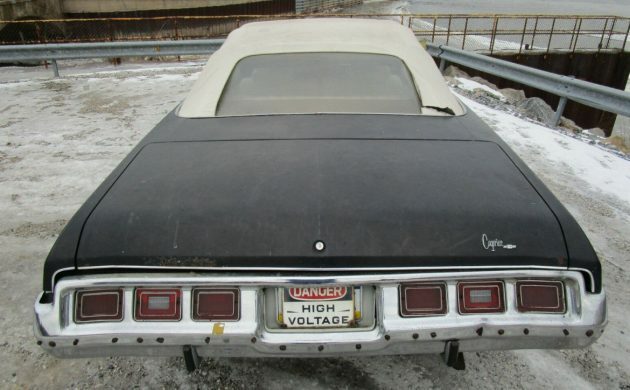 The same interior was kept from the 1972 Impala convertible while using Caprice emblems and identification. It has a working stereo radio. The power windows and locks work but are a little slow. The white vinyl seats are very nice and the power top works. This Caprice will need weather stripping and seals replaced. The carpeting has been removed and will need to be replaced. The air conditioning is not cold but is hooked up and will need to be charged. 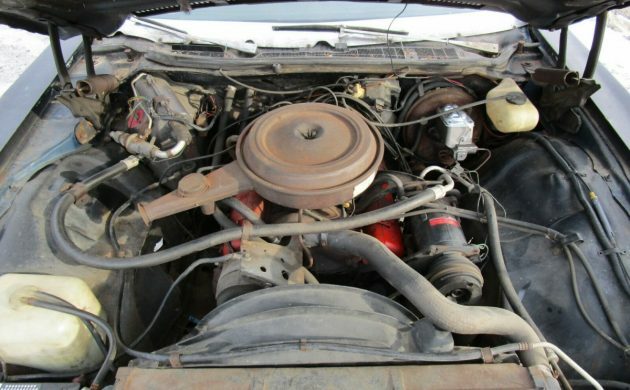 The car features a 400 cubic inch V-8 engine with 2-barrel carburetor mated to a 3-speed automatic transmission. It has new spark plugs, plug wires, points and condenser, fan belts, air filter, fuel pump, and the carburetor cleaned. The brake master cylinder has been replaced along with rear wheel cylinders, brakes bled, and new fluid in all lines. 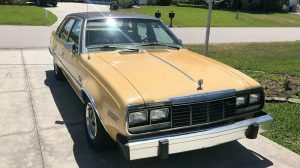 This Caprice does run very well after warming up a few minutes then it will idle on its own, but does have hesitation and a flat spot in acceleration. There is a slight exhaust leak. This car has 88,813 miles and bids are being taken. The seller has provided a lot of information on the car. Are you ready for a convertible for some cruising this spring? 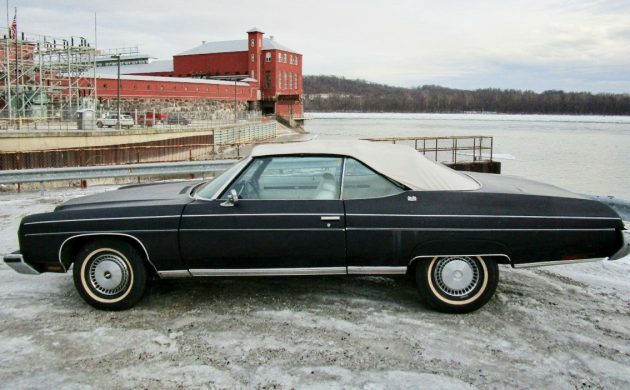 My first car was a 1973 Caprice Classic,with the same 400 motor and I loved it. 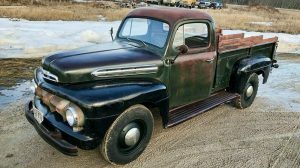 I remember having studded snow tires on it in the Winter, and smoking those tires on dry blacktop and those studs would just fly out ! (My dad would look at them from time to time and just shake his head) I have plenty of great memories in that car, and it looked great with 5 spoke Cragers and dual exhausts. I really like this convertible Caprice, the top down on a gorgeous Summer day is bound to get alot of thumps up. The price seems a little high, but only 7,399 convertibles were produced in 1973 and I can’t remember the last time I saw one. Good luck to the new owner, drive this rare beauty while you’re restoring it, there pretty easy to work on. (And don’t forget those studded snow tires…. 👍) This is a picture of my Caprice before the Cragers. Are you me?!? I adopted the exact same car from my Mom after she absconded with my 68 Eldo. Lent it to her for an hour while I was fixing the Caprice, got it back a year later. Code 29 Midnight Blue, light blue vinyl top, dark blue cloth gut. That 400 had bottom end torque for days! Sounds like the car NEEDS new spark plugs, plug wires, points and condenser, fan belts, air filter, fuel pump, and the carburetor cleaned. He only did minimal brakes and oil / filter. When I was 16 my friends dad had a red 73 Caprice convertible. Three years old at the time. Dad was retired Major in the Air Force. Mike and I would hop in the Caprice and roll through the gate of the Air Force base while the guard popped us a salute. We had too much fun in that car. The 2-barrel 400 was standard in Caprices. Brown re-paint? Looks like black to me. 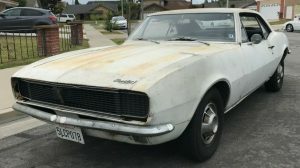 Price seems high for a car that needs quite a bit of work including rust repair, probably a re-paint, new tires, new top, carpets, maybe a complete exhaust, A/C work, and a host of little odds and ends. A good-looking car especially with the fender skirts. I’d like it for $4-$4.5k as you’d have to sink some decent money into it to get it presentable and mechanically sound. Minor in comparison to the other things it needs, but those ’79 full wheelcovers and aftermarket pinstriping aren’t doing it any favors either. 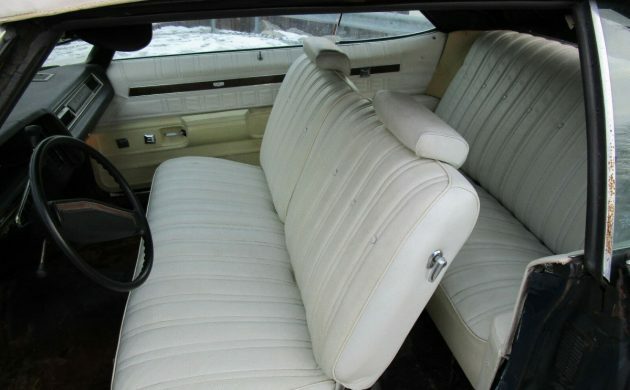 The ’73 Caprice wagon and convertible both had the ’73 Impala’s seat and door panel trim inside, a different style than the ’72 Impala. You could get all-vinyl in the Caprice coupe and sedan, in a more-luxurious style, than this–why they didn’t use that in the wagon and convertible is a mystery to me. bidding at $9,450.00. Seems quite high to me. I agree with Fordguy1972…about $4k would be my top offer. But, that’s in the dust now. So it was sitting for 15 years and he does not take tank off and clean it ? Just pours in gas ? Imagine all the sludge washing around i that tank. Just waiting to clog the lines.